Alumni Green Helps Sound Machine! Fund-raisers hope to see a return to the financially strapped NCCU marching band's glory days. 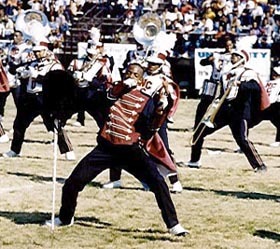 The NCCU Sound Machine - seen here in a file photo from 1999 - must get by on an annual budget of $13,000. According to 1972 graduate John Kinsey, the N.C. Central University Sound Machine used to be "the bomb." "It was one of the number one bands in the Southeast," he said. But the Sound Machine, the once proud maroon and gray, has fallen on hard times in recent years. And now NCCU's alumni are stepping in to do what they can to rescue the band. "You have to have adequate financial resources in order to do what you have to do," said NCCU band director Robyn Reaves. Reaves has been band director for 4 years. She says that there have been financial problems from the very beginning. The budget for all band operations – the Sound Machine, the concert band, the pep band, and the marching band – is a slender $13,000 per year. This sum must also support the band camp and Spring Band Blast, the annual workshop that attracts students from around the state. "By the time we go to a game and pay for all of the students meals and travel expenses, we are almost half way to spending all of what is in the budget," said Reaves. Bands at other universities fare better. N.C A&T, for example, gets $80,000 for their marching band alone, according to Reaves, who has researched other university band budgets. "Where is the equity? We have to beg for money because we are in debt," said Reaves, who stressed that the financial situation not only affects the band's ability to purchase instruments and uniforms, but also affects their ability to recruit students and staff. "We are vulnerable to the public eye," said Reaves. "Students look at different colleges to see whose band they want to play with." "Within this inadequate budget, we have not done any recruitment which involves mailing students to encourage them to be a part of NCCU band department, or any repairs on any instruments," said Reaves. It's a situation that alumni John Kinsey, Sylvia Casey, Dennis Ellis, Allen Fitzgerald and Maple Stevens, have found intolerable. So they stepped in to do everything they can to help the band. Kinsey and Casey are heading up efforts at the Charlotte Alumni Association. Ellis and Fitzgerald are working on the issue within the Durham Alumni Association. And Maple Stevens, president of the Winston-Salem Chapter, is working from that end of the state. Their efforts have just begun. Their focus is currently on helping the band get much-needed instruments. So far the group has managed to purchase trombones, mellophones, French horns and marching baritones. According to Reaves, Kinsey and the other alumni "have taken the baton and run with it." Alumni presented the instruments donated by the Charlotte Chapter to the band at Homecoming 2000. Alumni fund-raisers have big plans for the future. They hope to help with more than instruments, and plan to move on to uniforms, scholarships, and more. Kinsey's dream is for a partnership with the university that will lead to a 200-piece band. "I can't wait to see the 200 piece band with new uniforms, instruments," said Kinsey. "I want a reserved seat. As soon as they print the season tickets … I want to be in the house when this all happens." "There are certain roles that each role must play and we, as alumni, see our role as being the booster club," says Kinsey.